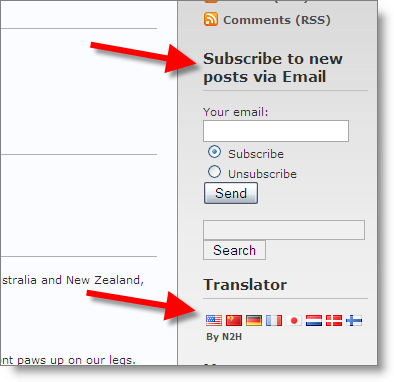 Just a quick mention of two add-ons to this blog that will make things easier for international readers and for people who are not sure what RSS reads are about. On the top right section of the blog you can see a section called “Subscribe to new posts via Email”. As you can guess this means that if you are not sure about RSS feeds, you can enter your email address and click on the Send button. A confirmation email will be sent to your account. Once confirmed, when ever I put up a new post you will be notified almost immediately. Pretty cool! If there are any issues, let me know. The second feature is the Translator located directly beneath that. Clicking on the flags will translate my blog to that language. This has proved useful for my Dutch friends here. Fem has proof read the Dutch translated page and she says that while it’s not perfect it’s pretty good. So if English is not you major language, it will now be much easier to read my posts. If there are an requests for additional languages to display let me know and I will add them.